As a candidate, a recruiter or hiring manager is gauging if you will be a good representation of the company and its brand. Being a snappy dresser might not get you the job, but improper dress and appearance is one of the most common reasons a candidate doesn't receive an offer. Clothes that fit properly, not too tight or loose. This is not the time to be uncomfortable because your collar is too tight! In the end the office may be business casual, but you aren't hired yet! Always go above what might be expected from you on a day to day basis. Tip: Different industries have different dress code standards. Financial sectors will expect a suit, but a job in parks and recreation may be overdressed in a power suit. Ask a Career Advisor for help! Well-tailored suits (pants or a skirt) should have a good fit. Stick to dark and neutral colors such as black, navy or gray. Be mindful of skirt length, skirts should fall just above the knee. Long sleeve shirts- Yes, even when it is 90 degrees! No leggings or yoga pants—ever. Tip: Have a backup outfit or shirt on hand and ready to go! You never know when you might get a smudge or lose a button. Choose a dark or neutral dress shoe. No stilettos, strappy sandals or platform pumps! Don’t fall victim to the white socks with dress shoes! Be sure that your trouser socks pass the elasticity test so they don’t fall down your leg midway through your interview. If you choose to wear jewelry, keep it simple. This is not the time to impress with your bling! Tuck in your shirt and wear a belt; when in doubt match the belt to your shoe color. Stick to a conservative look rather than trendy. This is not the time to push the fashion envelope. Avoid scented lotions, cologne or perfume- You want to stand out due to your brilliance not your smell! Jeans, tees, caps and sneakers are a No-No! 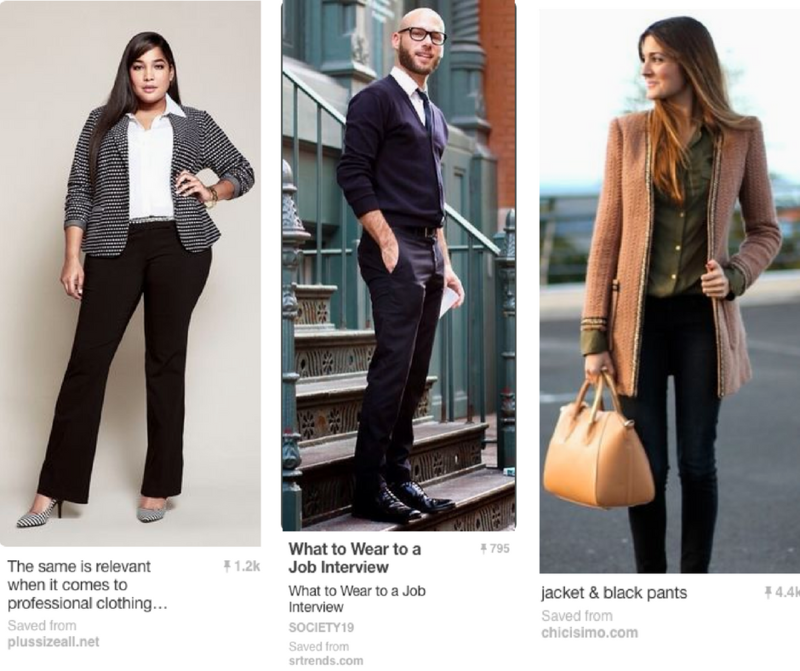 Q: What is business casual? A: It depends. Office culture is different at each place of business, but this usually means khakis and a nice shirt or polo. For interviews, always dress professionally. Khaki's, a blazer and a dress shirt are appropriate as well for many professional offices. Q: How much make-up or cologne is okay? A: If you wear make-up, choose natural tones with hair pulled away from your face. Avoid glitter or sparkly applications. Keep nail polish fresh and neutral in color. It is best to avoid cologne or perfumed sprays, as some people are allergic to chemicals.